The Strathaird Bed & Breakfast is located in the heart of Niagara Falls and offers Scottish Hospitality to all of its guests. All the nearby attractions in Niagara Falls, Ontario are located only a short walk down the Niagara Gorge, including the Horseshoe Falls themselves. 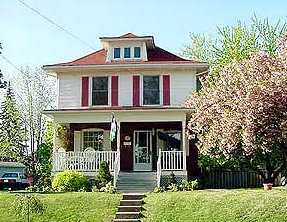 This B&B in Niagara Falls offers 3 wonderful rooms all with ensuite bathrooms. Real Highland hospitality, a a full Scottish-style hot breakfast, and an great location make Strathaird Bed & Breakfast a wonderful getaway. The Strathaird B&B is real Scottish hospitality for your next Niagara Falls Getaway. The newly renovated home is situated on a pleasant tree lined street and is only a short walk to Casino Niagara, the Falls & all attractions in the beautiful city. A full Scottish-style hot breakfast is offered to all guests of the Bed and Breakfast. After the morning breakfast, guests are invited to relax in the cosy sitting room with gas fireplace and colour cable television. Strathaird offers a full Scottish-style hot breakfast complete with bacon, sausage, eggs and hash browns served in the formal dining room. Enjoy fresh baked breads, muffins, homemade preserves and fresh fruits in season or guests may have a deluxe continental breakfast. Vegetarian breakfast available by request. Stay at the Strathaird Bed & Breakfast for two nights with this package and enjoy dinner at either the Beef Baron or Mama Mia’s Restaurant.